14/04/2019: Gorgeous, high class food. On the expensive side but you get what you pay for and the food here is beautiful. Really romantic setting. Perfect for couples. Highly recommend to anyone. 07/04/2019: This is staggeringly impressive. Had a family dinner here and it was spectacular! Cooked to perfection, wonderfully paired and really couldn't have been better! I've been raving about it since - if you're in Buxton, it really is worth the visit. It's also worth going to Buxton just to go here. 19/04/2019: Went with friends for Lunch recently and all agreed it was a great experience. The Lounge area for pre-meal drinks is cosy (small!) but the staff did a good job in politely moving guests from one area to another in order to cope with arrivals. 14/04/2019: First time at this pretty amazing restaurant. Had the lunch menu which gave 2 choices each for starters, main course and desert. Starting with a warm welcome in this oldie world building adds to the ambience. 19/04/2019: Visited for my boyfriends birthday after hearing such good things from friends. 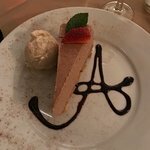 We weren't disappointed as the food was amazing!! 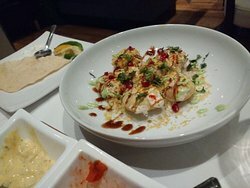 17/04/2019: In a city already full of great Indian cuisine, Lilu stands out as a fresh, vibrant and passionate restaurant. Or starters of soft shell crab and salmon was lovely, as were the prawns - perfectly cooked. We decided to go with a few 'sides' - Rogan gosht, butter paneer, bhindi and a main of vegetable biryani; all were a treat to eat and the chef even covered a fresh gluten free (and very good too!) chapati for me - a first in ANY restaurant I've visited. The chef/owner, Pratik, is a wonderful host - all in all an excellent evening - do go and experience it if you can! 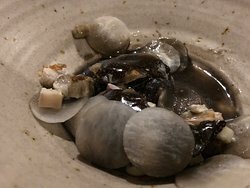 16/04/2019: Have been here twice and again it was an excellent dinner , very inventive without being confused, each flavor is properly brought together, top quality! 15/04/2019: My partner arranged for a taster menu and overnight stay at Sat Bans in January. I can honestly say that the experience was flawless from beginning to end. The touches in the room were lovely- e.g the Aesop bath products and speciality filter coffee. 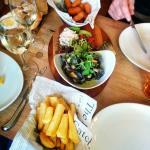 I found the food creative and well presented and staff were both knowledgeable and professional. I have seen some reviewers complain about the absence of smiling. Personally I find overfamiliarity unappealing when I dine out; if this familiarity is what you are looking for- I would perhaps try TGI Fridays. We loved how we had a copy of the menu to take away afterwards to remember this lovely occasion. Hopefully we will return one day. 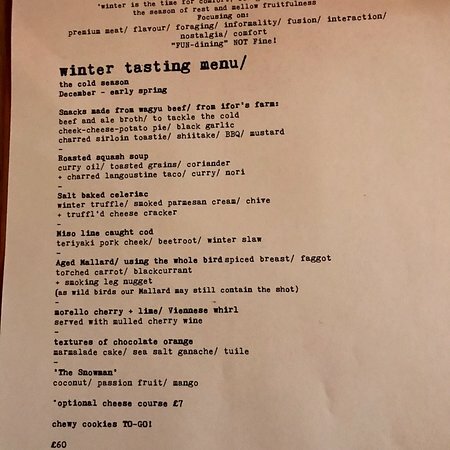 14/04/2019: Visited last Wednesday and really enjoyed the taster menu, we had the full taster which has some of the most amazing food and taste combinations that totally tantalise the palate. This young team just get better and better it is amazing the way they have developed from a team of totally dedicated self taught chefs, to be honest I visited a 2 star Michelin restaurant last week and honestly preferred the Lighthouse food. If you have not been you are missing a total food experience, visit and enjoy! 05/04/2019: Another lovely evening at The Lighthouse. The flavours are amazing along with the presentation.Staff are very attentive and so glad we live nearby.The take home muffins were a nice touch.We thoroughly enjoyed ourselves and look forward to our next visit. 18/04/2019: Last Sunday Mrs Cobb and I arrived for lunch at The Woodhouse Arms for Sunday dinner, I had previously booked a table in the dining room earlier in the week. We were told on arrival this place was no longer available, and taken through to the extended bar area, with hard uncomfortable chairs. We have been customers for the past years. It seems that if a larger group need a table in the restaurant you accommodate them first and disregard couples who booked earlier, One of the main reasons we have dined here in the pasts is because of the ambience the restaurant offers So if you cannot guarantee the table you have booked I cannot see any reason to book a table in the future. A very disappointed customer. 15/04/2019: This the food in this restaurant never disappoints and Sunday lunch is no exception. 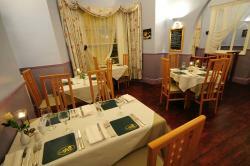 Meals are prepared individually - it's not a carvery, with a starters at £4 and mains at £11.95. There are about 6 main courses available covering meat, fish and vegetarian. 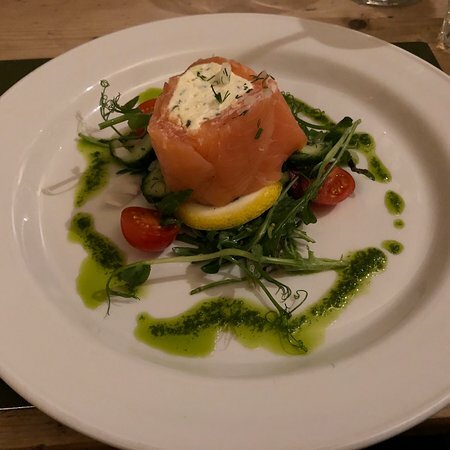 You should book as on Sunday's, it is very popular, There is a varied and plentiful selection of vegetables with the main courses. A highly recommended restaurant, with very pleasant and efficient staff. 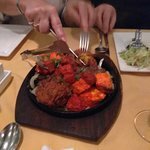 17/04/2019: I love Indian food and if you do too go no further than eating at the Calcutta Club on Maid Marian Way. There are a cluster of them there. Ignore them all and eat here. The ambience is great and the food is freshly prepared to your taste. They will ask how spicy you want your food and the menu is delicious. 16/04/2019: Visited on a Monday evening for my birthday along with my wife and daughter. Food was excellent. This is a premium curry house so prices are a little higher than others in Nottingham. Thing is the price reflects in the meals as the food is sooo good. 3 poppadoms, vegetable platter starter, butter chicken, garlic chili chicken, veg biriyani, garlic bread, 1 rice 4 pints and 2 cokes £92. Only thing for me for feedback is the service is too attentive. The placing napkins on our laps isn't necessary!! 18/04/2019: My wife and I had fantastic Tapas at Lorentes last night. Boy it was good,! every part was top class and a great explosion of tastes.. 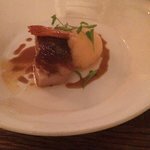 The service was friendly without fuss, the price was right and the food superb, what more can you want? Don't forget the meatballs. 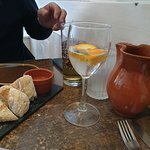 15/04/2019: We enjoyed tapas here on Friday evening- our first visit and the food and service was excellent! We will definitely return. 15/04/2019: A welcome find for weary walkers and tired dogs! Delicious food and coffee and a place to sit in the sun watching the world go by! 14/04/2019: Lovely old historical building, nice garden with covered seating for cooler days. Friendly efficient service accompanies tasty food an drinks - job done! 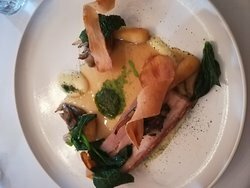 14/04/2019: Returning to Stretton meant a return to the Jackson Stops - a highlight of our visit with wonderful food. Service was great, polite but friendly and atmosphere was warm and intimate. Thoroughly recommended. 12/04/2019: A super lunch with locally sourced produce. The staff were very attentive and nothing was too much trouble. The prices were very reasonable for the exceptional quality of food. Would definitely visit again. 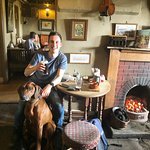 17/04/2019: We were staying down the road in Stoney Middleton and chose Curry Cottage after seeing the reviews on trip-advisor. We were not disappointed. For starters we opted to share onion bhajis and meat samosas, both of which arrived sizzling on a hot plate and were stunning. For mains we had chicken tikka masala and chicken passanda, which again were very nice. The cheese Naan was unusual and unlike any we have had before, very light but very nice. Service was fast and the waiter was pleasant and happy to help. The chef had accidentally made us the wrong naan bread, the waiter brought us the correct one and apologised before we had even noticed. Would definitely return. 19/04/2019: Opening night, brilliant, better than ever! New management same chef, freshly refurbished and alot lighter! Whos angelo?????? 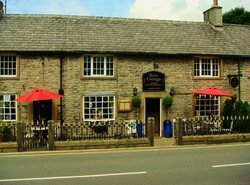 15/04/2019: Having read the reviews we booked for lunch after a Spring drive in the Peak District. There is roadside parking but, having restricted mobility, this was a disadvantage. We received a warm welcome, were shown to our table, good job we booked, and ordered drinks and food. This was outstandingly good; lamb and duck, both perfectly cooked and served pink were well worth the short wait. Compared to he main courses the sweets were not in the same category; my Bakewell pudding, served with good hot custard was lukewarm and were overpriced. There was only one member of staff greeting customers, serving drinks, taking orders and settling accounts which led to irritating delays Only other problem is that attention needs to be given to the toilets which were not as clean or well maintained as they could be. 13/04/2019: We visited this week - booking, certainly during school holidays, seems essential. 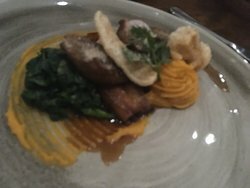 It looks rather rustic inside and the only menu is on a chalkboard, there is no children’s menu but they offered my son two or three options. I did wonder how welcome children were though they were very accommodating whilst we were there. The food was really tasty, it’s obviously all freshly prepared so a fair wait for it but worth it. My ameretto at the end of my meal was served in a half pint glass, the table sloped terribly and we were crushed in a corner when anybody came into the bar but we had a lovely, cosy evening with good food.